Do you smell the vacations? Do you feel the sun? Right, I don’t that much either… Toronto is having a weird summer. How is yours? Today, we are doing this a little different on Bon Appét’Eat. I invited a friend to the blog, she is not a blogger, she used to be though, in French. How did we meet? Who is she? What did she cook for you? Have a seat, prepare one of her Margaritas and enjoy the reading! You will love Noelle! How did we meet: Apart from our common passion for food and the fact that we are both French girls lost in Canada, Melanie and I did have in common our kids born in the same years, believe it or not we actually met in prenatal classes! And later, when I finally reach the couch knowing that I still have the laundry to do, the dishwasher to empty and the lunch boxes to prepare, I know exactly what I want … I want a margarita with fish tacos, or even better ceviche tostadas like they make it in La Carnita (on College street in Toronto). Oh yes! I’ll do that and I’ll make it 2, to treat my husband and myself for our hard work! And guess what? This was just the perfect idea for Melanie’s blog. This is such a treat for us and for YOU! Why should you try it? Because it feels like being on beach at the Riviera Maya without bringing all the sand in your living room. No kidding! What did I tell you? Isn’t she super nice? Don’t you feel like sitting with her and sipping on that margarita? - Moisten the rim of a chilled rocks glass and dip it in a dish of salt. 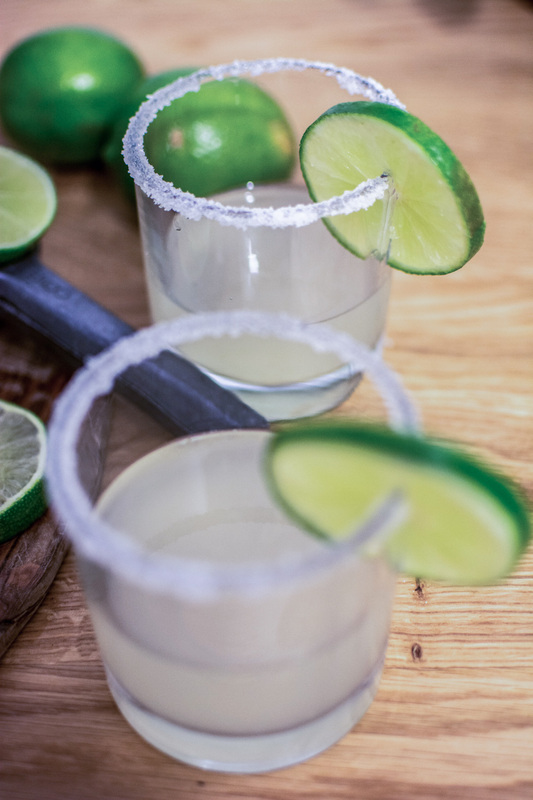 - Shake all ingredients with ice and strain into the glasses. 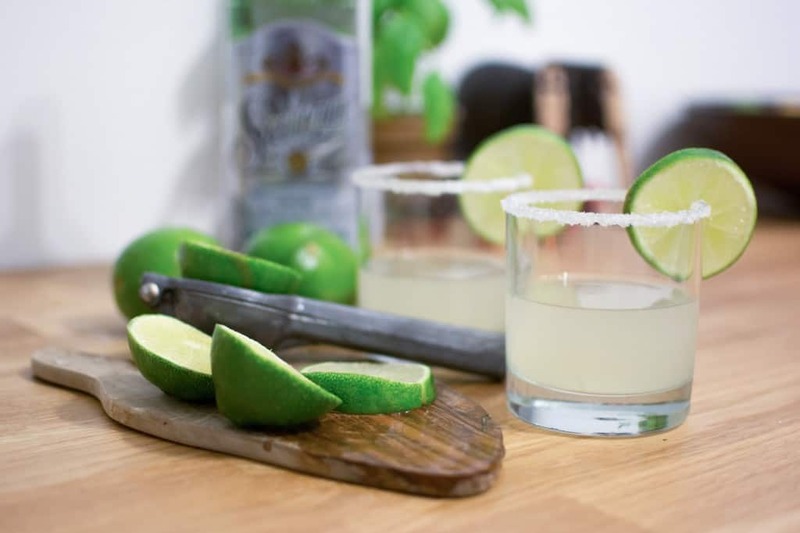 - Garnish with the wheel of lime. 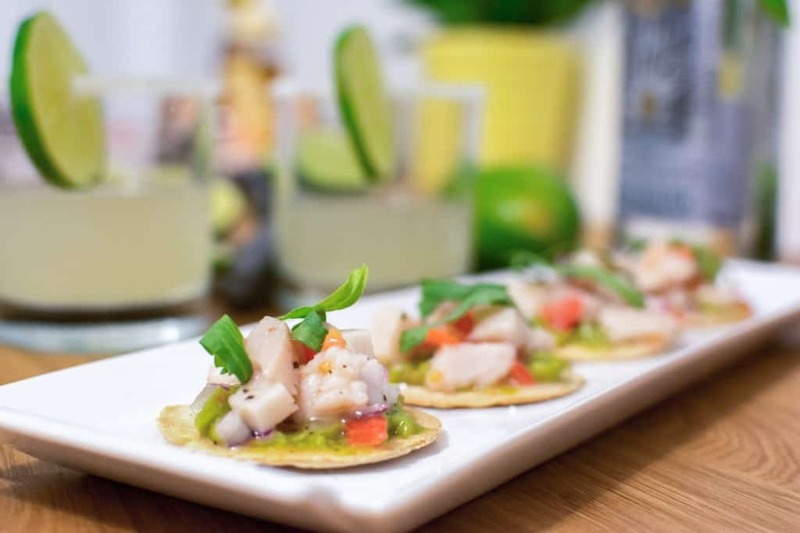 - Prepare the ceviche: Cut swordfish into small squares. In a bowl combine the fish and 1 cup lime juice. Let marinate for 30 minutes in refrigerator. - Drain and discard lime juice. Combine swordfish with 1 tablespoon lime juice and the remaining ingredients. Toss well and chill for at least an hour or as long as overnight. - Pre-heat your oven, and heat the tortillas using the broil function. Not more than a few minutes. - Allow to cool a few minutes. - Spread each tostada with guacamole. Top with the ceviche and serve. - I am not the spicy type but if you feel like it you can add a small jalapeno to the mix to heat it up! - If, like me, your favorite grocery store do not sell 5 to 6 inches soft corn tortillas - Just cut a classic size tacos using a cutter. WHERE did you find your swordfish? We looked all over the place (that might be a bit far fetched) last summer to make on the BBQ and couldn’t find any. The tostadas look so fresh and tasteful, I would love to take a bite in it. She found it in Loblaws and you can substitute by halibut or red snapper. She mentioned that in Ottawa on the byward market at Lapointe (www.lapointefish.ca) she saw a lot of choice! It does help, thank you. I didn’t know they had some at Loblaws! 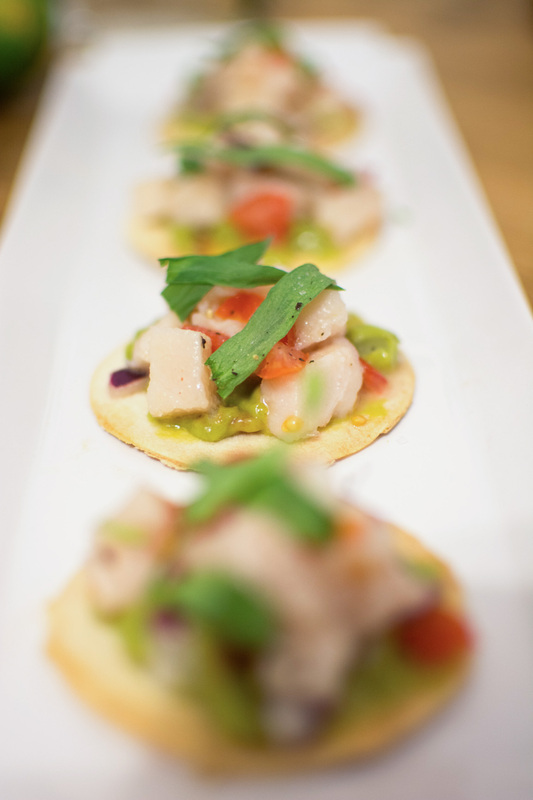 I love the pairing of the margaritas with these tostadas! I definitely think that your friend should start her own blog again, Melanie! The perfect combination, looks delicious. Thank you so stopping by Ayngelina!